Known for their consistency, style, and quality, the client is a top Australian architectural firm with a century-old experience in stair design and manufacturing. As a progressive enterprise, the client combines design, craft, and technology to provide high-end stair design and development services to a growing list of clients. Based out of Victoria, Australia, the client operates across all three states across the continent. The client needed a skilled 3D drafting and design service provider to work alongside with them on their new catalog for their ecommerce websites. The images needed to showcase innovation and ergonomics to make it appealing to the prospective customers. There were various categories of staircases that needed to be designed fitting residential, commercial, or industrial usage purposes. The initial hiccups for this project involved unclear images which required walking through the process of enhancing images for optimal usage and clarity. Additionally, the images needed to meet geographical requirements and Architectural standards (AS4100). Outsource2india is a pioneer in providing digitization services to its growing list of satisfied clients. With an experience in working with some of the top names in the industry, our team has gained the confidence to meet complex requirements within the deadline. The team followed a swifter project management process and a communication channel to ensure that each and every image met client expectations. The team worked on 100+ models from 10 families of stair design and provided a high level of details, texturing, lighting, and understanding of fabrication to ensure easy installation. The client provided information on rendering of the Sketchup files which included scenes, lighting, resolution, and angles specific to each design and the team provided 3DS Max files as outputs. With 3 core modelers, a quality analyst, and an account manager, the team was able to deliver the project in 4 weeks. The client was highly satisfied with the results we provided, not only in terms of the quality of the drafts but also the quick turnaround times we provided. The client even promised to outsource their future projects to us. Outsource2india provides high-quality top of the line 3D modeling, drafting, and ideation services at an affordable price. Bringing various innovative and creative ideas to life for marketing, branding, and/or visualization purposes, our team boasts of being highly skilled and creatively motivated. 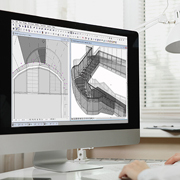 We are an ISO-certified company and provide clients with high-quality prototype visualization to provide enhanced designs that meet international quality standards. Contact us today to learn how our 3D modeling and rendering services can help your ideas fly higher.